Is Renting Affordable in Snohomish County? You will see from the chart below that renting is becoming more and more unaffordable. 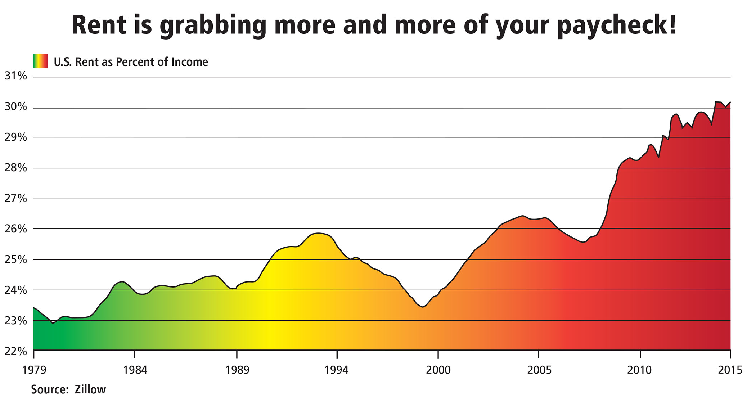 A greater percentage of household income (now over 30%) is going to pay for rent. Wouldn't it be better to buy a home, build equity and receive tax benefits? You Can Build Equity. Historically, homes rise in value anywhere from 4% to 6% per year, sometimes more, sometimes less. Staying at least five years, home ownership is usually a great value. You Can Take Advantage of Tax Breaks for Homeowners. Homeowners can deduct their mortgage interest payments and property taxes when they itemize their federal income taxes. These deductions may offset the cost of your housing. Your Housing Payments Will Stay Stable. If you choose a fixed-rate mortgage, your principal and interest payments remain the same for the duration of the loan. However, your homeowners’ insurance and property taxes can change. But you won't have a landlord who can raise the rent at any time. You May Be Able to Use Your Home as an Investment. If you buy a home and choose to leave it, you can rent it out and generate income. This works best if you can cover your mortgage (or more) with rental payments. With this in mind, it pays to choose a home that will make a good rental property in the future. You Can Settle in a Community. Once you own a home, you are more likely to become more involved in your community because you know you’ll be there a while. You can get to know your neighbors, perhaps join a homeowners’ association, or volunteer for projects that benefit the community or the local school. You Have the Freedom to Decorate as You Please. One of the joys of homeownership is the ability to change your environment to suit your tastes. Of course, if you live within a development with a homeowners’ association you may have a little less freedom with your home’s exterior, but you can still paint your kitchen lime green if you like. ​If you do decide it's time to buy, check out current mortgage rates.